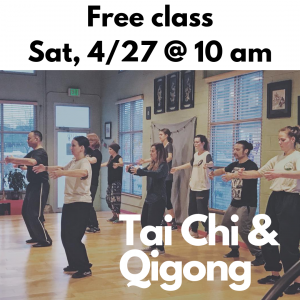 In celebration of 2019 World Tai Chi and Qigong Day, Awake Boulder is offering a FREE class on Saturday, April 27th at 10 am. The class will be a great introduction to a couple of different types of qigong, as well as the beginning of a tai chi form. We will explore a couple of different types of qigong (both active and static). The first type will include gentle movements blended with mindful and calm breathwork. Accordingly, this promotes the movement of blood and qi (life force energy) throughout our bodies for health and healing. Qigong can help ground us by quieting the mind. And bring our awareness back to the present moment. As well as into our bodies. The second type will be a static kind, either standing or sitting, depending on the participants that attend. Tai Chi (or more correctly, Tai Chi Chuan) started as a martial art first. However, hundreds of millions of people now practice it for its health benefits and mindful aspects. It is a gentle form of movement that promotes relaxation, flexibility and balance of body and mind. Consequently, tai chi is often described as “meditation in motion.” It is deeply rooted in Daoist principles. Because of this, at the core of the practice is its observance of nature. As well as the natural flow of life. Indeed, it is from this harmony we can discover our very essence. That of inner peace and stillness. With this intention, Tai Chi at Awake Boulder has a focus on health and wellness. Kuf Knotz is an Indie Progressive Hip Hop & Soul Artist who has combined forces with Christine Elise, a classically trained Harpist/Pianist/Vocalist for a very different and dynamic sound where no music territory goes unexplored. It is this attitude that has led Kuf to open for other top acts – Wyclef Jean, Lauryn Hill, The Roots, Arrested Development, Bone Thugs & Harmony, & Rising Appalachia. If you’ve been waiting for something uplifting, different and edgy, this class is for you. 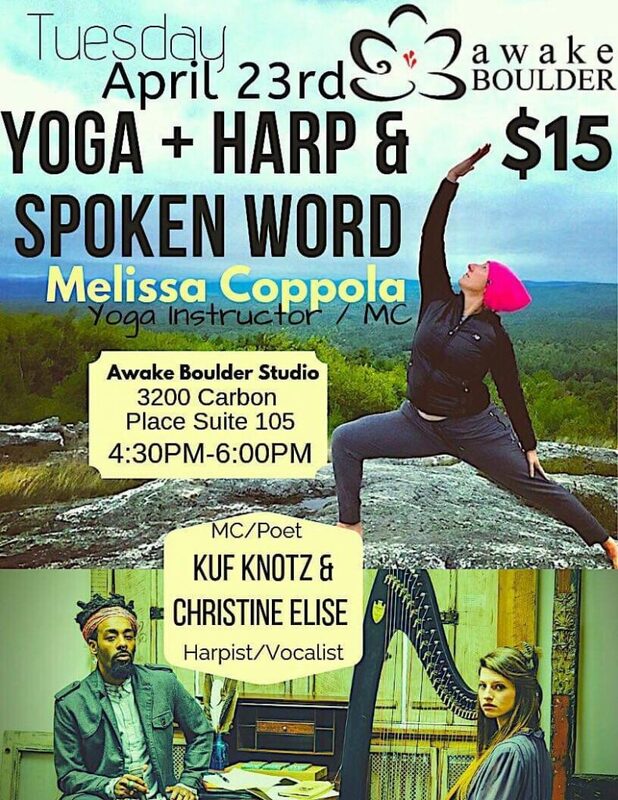 This 90 min all levels vinyasa yoga flow taught by Melissa Coppola (yoga instructor and hip hop artist), will be accompanied by these dynamic and beautiful sounds to transport you to a place of true connection and bliss within. Anger is one of the main reasons for feeling stressed. It can ruin a good day, a good relationship, a good life! Sometimes we think anger will help us ‘win our battles’, and we rely on it as if it were our trusted friend. Anger, irritation, dislike, and frustration, however, do not solve problems — they make them worse and lead us deeper into stressful situations. 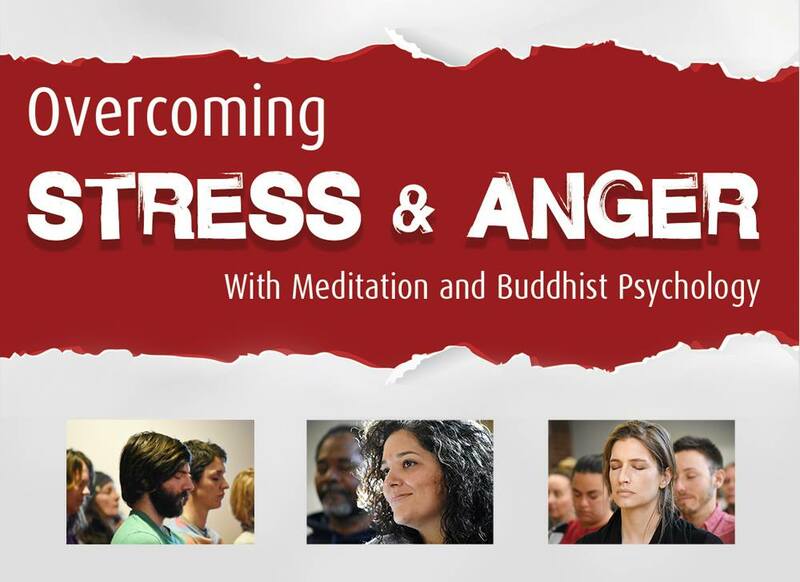 In this series of meditation classes, learn skillful techniques to remain balanced, flexible and peaceful in the midst of difficult situations and conflicts, thereby overcoming our real enemy: The painful feelings of anger and the stress they cause. Each class consists of a guided relaxing meditation and talk to help us solve our daily problems and find the lasting happiness we seek. Beginners welcome. No need to bring anything or wear special clothing. Cost: $10 per class. Seniors/Students: $7 per class. Preregister online or pay at the door. No one is excluded due to lack of funds. Class will be led by Kat, a Boulder resident (500-hour Yoga Alliance certified) and an Usui Reiki Master graduate. She teaches from the heart, offering ancient wisdom with a modern twist, along with joyful physical poses designed to move you on and off the mat! An approachable and sacred flow to start off your Sunday morning! You’ll find a safe place to explore your practice through guided moving meditation. This is an all levels flow, catering to every body. The movement, breath, and music synchronicity gives to a sense of a well-rounded practice! Cassidy started her practice 8 years ago allowing the mat to become a place of self discovery. This profound practice is something she wants to share with everyone. 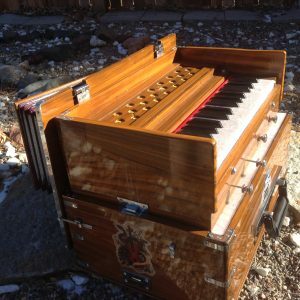 With a special love for powerful music and sacred meditation, she brings a unique and creative view to her teachings. Knowing that this practice is accessible for everyone, her classes are inclusive and lighthearted.